Yes, there have been a lot of things happening at White's over the past four years in upper management/CEO's, with engineers and such, but also a lot of changes in the whole metal detecting industry. Changes in detector design and advancements that not all manufacturers have kept up with. Here in the USA we have seen a major decline in the number of active metal detecting clubs. We probably have less than 30%, easily, of what were around back in the '87 to '97 decade. There are far fewer 'local dealers' to promote the sport, and so many of them left around today don't really get out detecting. Some I visit in my travels who sell detectors don't detect at all, and some are older and used to detect, or do on occasion, but nothing more than your typical periodic urban Coin Hunter. When you ask a dealer, local or some on-line vendor, to explain things like Ground Balance, Discrimination, or the meaning of terminology such as VLF, VCO, Tone Break, Ferrous Volume, or explain what a VDI scale means on a particular detector ... good luck because many sell them but don't use them or really know them. Jimmy wasn't a reason White's fell behind on engineering, and his modified White's models were promoted to his dealers in his territory, and I heard from several dealers who were not able to purchase the regular line versions of models. The Discounting Frenzy sure hasn't helped the industry here in the US, to be sure, and so many dealers have closed up shop. There has been quite a following, here and elsewhere, mainly for Minelab FBS models and XP's Déus, and while interest in those detectors was growing, all US manufactures were feeling the market influence. White's did offer up the V3i and little brother VX3, but as I, and you, know, their own MXT Pro/All-Pro was, and is, a better all-purpose performer from all the in-the-field comparisons I have done as well as controlled test scenarios. Garrett brought out the AT Pro and then two follow-up models in the 'series' but without any real significant improvements of newness about them. FTP as offered up a few new models, like the budget priced Euro-Tek Pro and F-19's, but not much else. You almost get the feeling they invested R&D money in a new decal designer and new-name creator as they have offered a few newish models with colorful decals that are more-or-less Bounty Hunter, Teknetics and Fisher units just switched around, renamed and re-decaled with little or very minor new features. I have tried several and they were stinkers for the cost. The ONLY company/companies, that have come onto the scene for the recreational metal detectorist since late 2014, bringing new models, continued model advancement, added features, adhering to a 'simple' yet 'functional' design along the way, and giving consumers very dependable performance have been Nokta and Makro. In December of 2014, the owner of Nokta bought out all the interests from his brother, who had Makro, and they have combined these two brands, made in Turkey, using some very talented engineers, a great 'team' of employees, and have been the most attentive of all manufacturers to monitoring the end consumers. Following many metal detecting Forums, listening to what we, the end users, have to say, and staying abreast of what is going on in this industry. A few followers might know the name of Alper Tozan, their lead software engineer, but everyone knows who the one, and only Nokta or Makro Detectors spokesperson is on any form or other discussion, and that is Dilek. Can anyone name one person from Garrett, Tesoro, Fisher, Teknetics or White's who is regularly there on the Forums to monitor White's products? Stay openly in touch with any issue that arises with a product AND quickly address and resolve the issue? Nope! Yes, we have Steve Howard who's been around for a long time. I first met him in mid April of '85 at White's so he's got ample time in down there. And we all ought to know Tom Boykin who is newer to this great sport and metal detecting industry, but has come onboard at White's and is doing well to be visible on-line and answer questions. He'll be an asset to White's down the road, I'm sure. Yes, White's has seen a lot of personnel changes within, and many changes in the way of Dealers and Distributors, and have been a little slow at addressing their product line to bring us anything new and improved ... until recently. The MX Sport was a newly engineered model they released in 2016, but before getting all the bugs worked out. They needed more units out for evaluation, then address all the problems, and then release it. That early release and issues kind of put a damper on things for a while. I like the physical package, but not the stock big and awkward balanced 10" DD coil, and the first released units I checked out were too noisy and just didn't work well. But I felt the potential was there once the bugs were dealt with. And I really wanted a land-based model of that software design, too. The MSRP was more competitive and that was good. Today, things are moving along in a better direction for White's in my opinion, because a few months back they announced the new land-based model, the MX-7, in an attractive Bengal Orange color. I drove over to White's from Vale, bought one at the 'prototype/production' stage, along with a 7" DD made for them by Detech. I knew it worked on the MX Sport units I tried last year, and it works fine on the MX-7. I was also provided an unlabeled 6½" Concentric coil to evaluate pending release this spring. I had Monte Jr. glue it together and make a custom decal for me as seen in the attachment. I set out to evaluate the MX-7 and was so impressed, I traded a back-up model from my arsenal to a Texas White's Dealer to get a 2nd MX-7. That one has the 7" DD coil mounted. 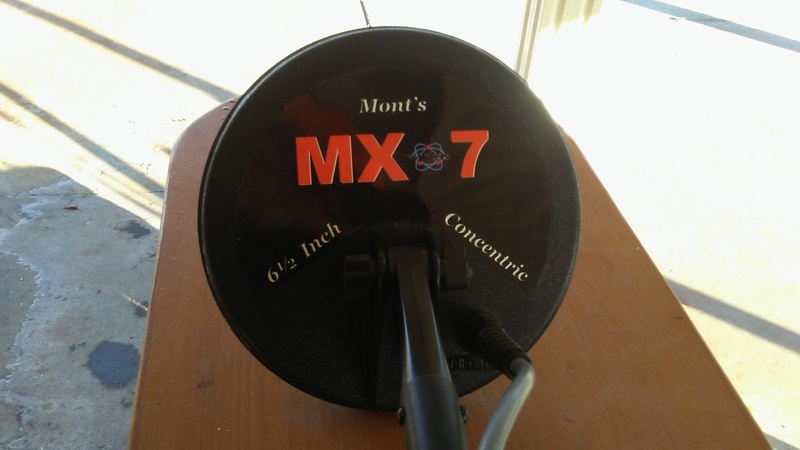 We've had some favorable pre-spring weather and I've hunted with them, and other detectors, mostly at some trashy old sites and last Monday I received my 3rd MX-7 just to round-out my Regular-Use Detector Team. I still am not thrilled with the complexity of the V3i and refer inquisitors to White's MXT All-Pro or the new MX-7. Sorry to ramble but you were right. It seems White's kind of fell behind for a while, but it looks like they are stepping it up now, and as a long-time White's user I do hope they get and stay competitive. I enjoy my MX-7's and my new-to-me trusty XLT, but as I told them at the factory, as good as this new model is, it won't replace some proven performers in my arsenal from Nokta and Makro. All detectors have their strengths and weaknesses and I like to have a 'Team' of detectors that work well and complement each other. Mine do. Jimmy's a nice guy, and there are naturally two sides to every story, but in some cases the books aren't really worth reading. Unfortunately he's not a Distributor, but it didn't cause White's to fold up their tent and those territory dealers can still do okay, but there are changes in marketing and sales these days. Hope you enjoy the new detector you have coming, even though it is a White's cpompetitive model, but I have one like it in my arsenal and it isn't going anywhere. Let's hope for some favorable springtime weather. Get out hunting when you can, and I look forward to seeing you just 5 weeks from this coming Thursday for our 7th WTHO over here on the East side of Oregon. Come prepared to work your detectors in amongst all brush, rocks and likely some trash.. How about if we plan on an Indian Head cent or two showing their face in some of your recoveries? Matter of fact, I'd like to pull one out somewhere on this outing as well. Competition.